MILAN (Bloomberg) -- Fiat Chrysler Automobiles CEO Sergio Marchionne made a surprise return to Italy from the United States last week to solve a labor dispute at the Grugliasco car factory near Turin, where the carmaker is boosting Maserati production as part of a strategy to move upscale. When Maserati workers entered a conference room at the plant on June 23, they were expecting to discuss with the plant manager how to meet booming demand for the Ghibli compact sedan. Instead, the employees found Marchionne sitting at the table. Marchionne warned the Grugliasco staff that a June 16 strike risked creating negative publicity in the United States, where he is moving Fiat's main stock market listing later this year. Marchionne showed the group a video of Rich Boruff, local head of the United Auto Workers at the Tipton plant in Indiana, praising Marchionne for saving Chrysler's factory. Marchionne’s relations with unions have been better in the U.S. than in Italy, where he often clashes with labor groups on his campaign to boost productivity with more flexible rules. "This meeting showed how important the Italian plants are becoming to Marchionne's new strategy," said Roberto Di Maulo, head of the Fismic union, one of the largest representing Fiat's 62,500 workers in Italy. "Italian car workers have suffered for years." Marchionne met with the Grugliasco workers for more than an hour before announcing production changes at the Maserati plant. He bowed to the union’s request and reversed a decision taken a week earlier, giving the green light for the transfer of 500 laid-off workers from Fiat's main plant at Mirafiori to Grugliasco. Marchionne wants to build eight new Alfa Romeos and four new Maseratis by 2018 at the carmaker's Italian factories. These models will be sold mainly outside Europe as part of his plan to boost deliveries 61 percent to 7 million cars by 2018 and increase net income fivefold to 5 billion euros with a wider offering of luxury vehicles. "While Marchionne wants to lure U.S. investors to invest in the carmaker, he needs to reassure them he has a full grip over operations in Italy, where he will carry the most risky part of his investment plan," said Vincenzo Longo, strategist at IG Group in Milan. Grugliasco is the only Fiat plant in Italy that's currently operating at full capacity because Maserati is on pace to double sales this year. Maserati and Ferrari deliveries have almost tripled in the first five months globally, while Fiat's have dropped 1 percent in Europe. At Grugliasco, a plant Fiat bought in 2009 from the bankrupt Italian contract manufacturer Bertone, Marchionne's decision to add Saturday shifts and cut a week of vacation in August prompted 11 percent of the almost 2,000 workers to strike for an hour on June 16. The protest, a week before Marchionne's surprise visit, cut Maserati production by 11 cars. "Working conditions at the Maserati plant are getting tougher because of the peak of demand," said Federico Bellono, a leader of the Fiom-Cgil union who joined the strike. He credits the protest with highlighting the need for better labor relations. "He came from the U.S. to retract his decision" on transferring staff to Grugliasco, said Bellono, whose union won a legal battle against Marchionne at Italy's highest court last year to get its members accepted by the carmaker. Now, Marchionne must find a breakthrough on stalled wage talks after eight months of negotiations. Unions are asking for an annual increase of 300 euros, while Fiat has countered with an offer of 250 euros. 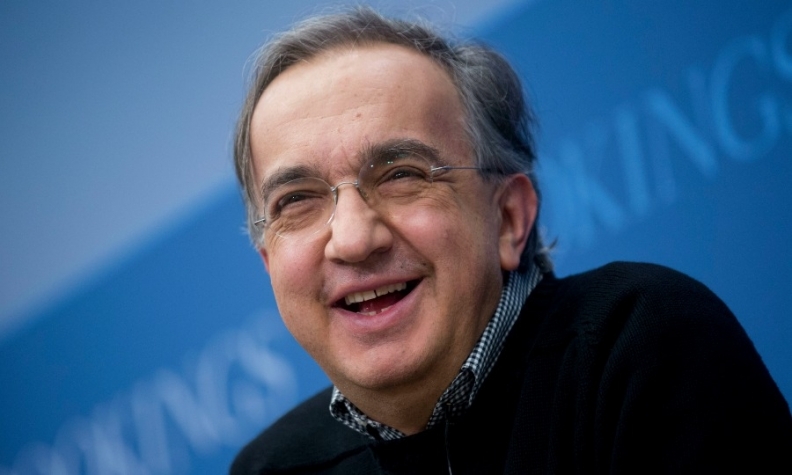 Marchionne argues that Fiat's unprofitable car production in Europe make salary increases difficult. "We need to sit down and find a solution on the wage contract renewal," Di Maulo said. Marchionne is making another trip to Grugliasco today, when he will attend the annual meeting of the local employers' lobby that will take place at the Maserati plant. Prime Minister Matteo Renzi, who was scheduled to attend the event, will remain in Rome to oversee a cabinet meeting, news agency Ansa reported.